You can custom brand your SmartVault Portal, including the subdomains, sign in page, header, color schemes, and emails. Before you begin, make sure that you have the logo you want to use for your header and sign-in page, as well as the logo you want to use for your email header. You can use the same logo for both headers. You can use a tool like ColorZilla to find out the colors of your website or any site you like the look of. See ColorZilla for Firefox. Note: For security reasons, we do not allow a firm's clients to directly sign in to SmartVault from the firm's website. SmartVault requires an outside link to prevent problems if your main website is hacked. By requiring links with redirection to our secure site, we prevent any security issues arising from the firm's main site, and stop security issues such as the capture of SmartVault usernames or passwords. 1. Sign in to the SmartVault Dashboard. 2. Click the gear icon on the top right of the screen. 3. 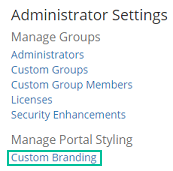 Under Manage Portal Styling, click Custom Branding. 4. After making your changes, click Save. Note: Click Restore Defaults to restore the default settings back to original settings. In order for users to access your custom-branded portal, you must specify a subdomain name for your portal. The Subdomains section lets you enter your subdomain name. The default domain is my.smartvault.com. You can replace the my with a subdomain of your choice. For example, a subdomain for EZ Taxes could be eztaxes.smartvault.com. Enter your subdomain in the text box and then click Add. To remove a subdomain, click Remove. You can specify the settings for your sign in page. You can enter your own sign in and body text message that users see when they log in. The numbers represent the line you are changing. The Header Text field has a limit of 20 characters, and the Bod Text field has a limit of 45 characters. The Background Color, Text Color, and Link Color sections let you set the color of the background, text, and links respectively. The numbers represent the text you are changing. You can upload your own logo so that it is displayed in the top left of the portal. The header, or masthead, is the header section that displays on all the pages of the web portal, including the Sign In Page. You can also set your masthead background color. The logo must be a .png, .jpg, .jpeg, .bmp, .tif, or .tiff file, and no greater than 340 pixels in width by 60 pixels in height. To resize your logo, you can use Microsoft Paint, Adobe Photoshop, or an online service like PicResize or PIXLR. 1. Click Choose File and locate your logo. The Masthead Background Color section lets you set the background color of the masthead. You can customize the settings for your outgoing emails. You can add your custom closing email text, such as an email signature, up to 1024 characters.